Are you running vCenter Server in a virtual machine, what are your high availability options? Whilst presenting our virtualization solutions for various customers and at many conferences, one question that often gets raised is that of the availability of a virtualized vCenter Server, especially more so when I talk about Symantec ApplicationHA solution. 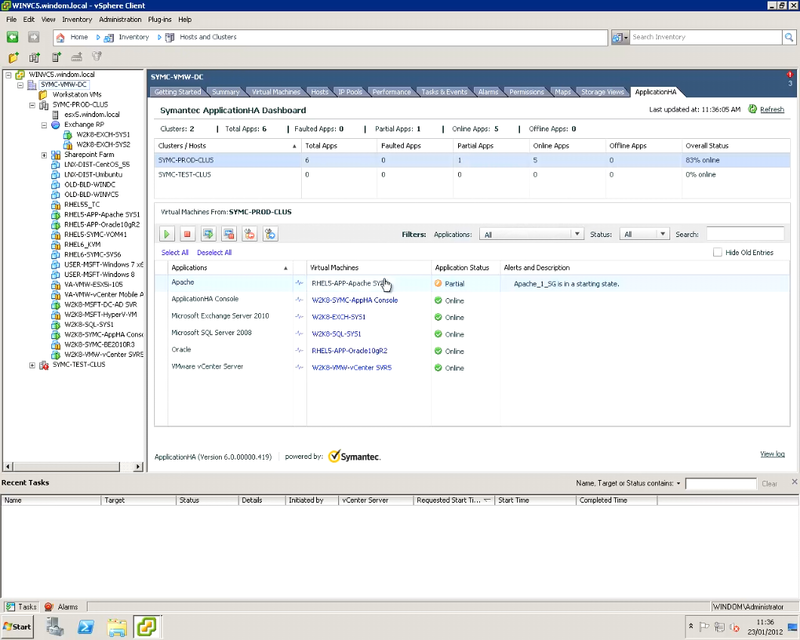 There seems to be various options available if your vCenter Server is sitting on physical hardware such as VMware’s vCenter Server Heartbeat or maybe with another vendors solution, Symantec too has a dedicated vCenter agent which runs on Veritas Cluster Server and can protect the various components of vCenter Server as well as Oracle or SQL databases which may be part of the configuration. But when the vCenter server is virtualized then these solutions may be a bit of an over kill or may impose limitations on vMotion due to shared storage requirements, or maybe be a little expensive for those on a tight budget but still need an availability solution. If you think about it, those solutions provide hardware and software protection, whilst if we take a look at a virtual machine it’s probably one of the more stable platforms, one could run an application on, all virtual machines with VMtools deployed typically run on a selection of the similar types of network, disk, display drivers due to the nature of virtual machine hardware and portability requirements. Just think about the last time you had a blue screen on a Windows virtual machine or when your Linux virtual machine did a panic or core dump due to driver related issues, more often the issue with downtime is typically due to application faults, and according to Gartner this can be up to 40% for a leading cause of unplanned downtime. Wouldn’t it be easier to have a solution that monitors all the key components of a virtualized vCenter Server along with SQL or Oracle backend configuration databases and resolve any issues that may occur within them? Symantec ApplicationHA has this ability and not just tailored for vCenter Server, ApplicationHA can also control a vast array of enterprise applications such as SQL, Oracle, Exchange and SAP to name but a few, all of which can be view from within the Symantec ApplicationHA Dashboard directly from within the VMware vSphere Client. To control vCenter Server, Symantec ApplicationHA primarily monitors the services that are installed with VMware vCenter Server. However, if configured on the same machine as vCenter Server, ApplicationHA also monitors the SQL Server or Oracle database. ApplicationHA automatically discovers and monitors these resources. During the vCenter Server installation, you can choose to install the embedded version of SQL Server (SQL Server Express) to host vCenter Server’s information. If you install it, then ApplicationHA monitors it. 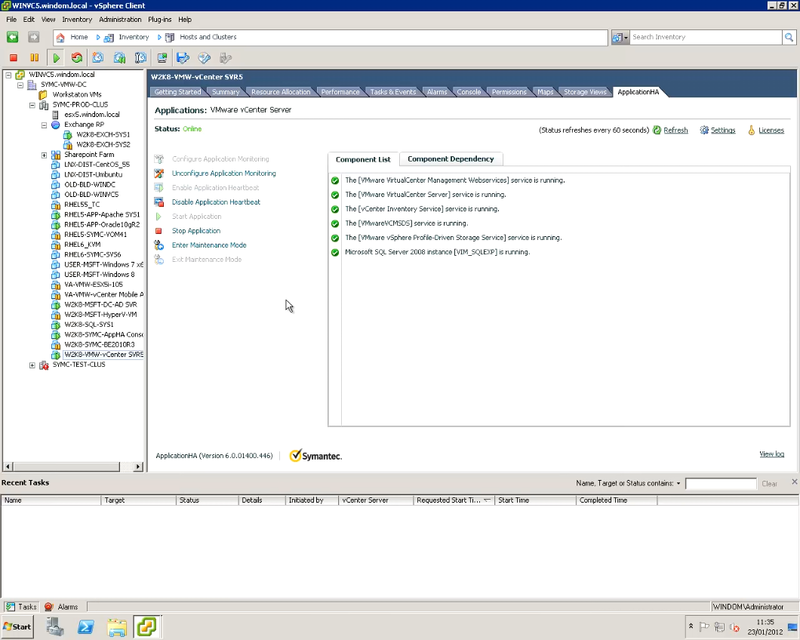 You can configure application monitoring for vCenter Server on a virtual machine using the Symantec ApplicationHA Configuration Wizard. vCenter Server protection of the vCenter environment can be carried out in matter of minutes and management is integrated directly in vSphere Client or Web interface if needed also. Fig 2. 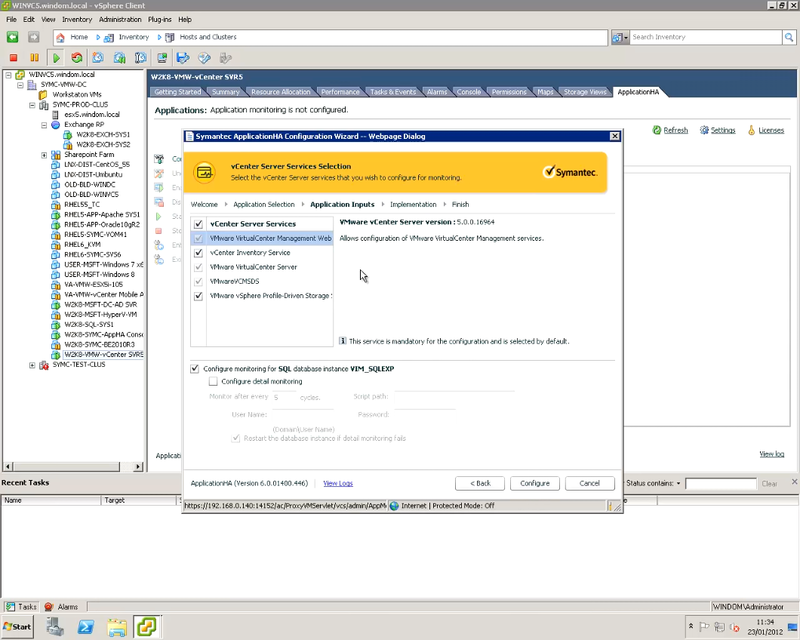 Symantec ApplicationHA Configuration Wizard for vCenter Server. So if protection of your vCenter Server is important to you and budget is limited, then take a look at Symantec ApplicationHA and test drive a 60 day evaluation and see for yourself just how flexible this solution is for availability of your applications running in virtual machines, not only for vCenter Server but for other applications also. 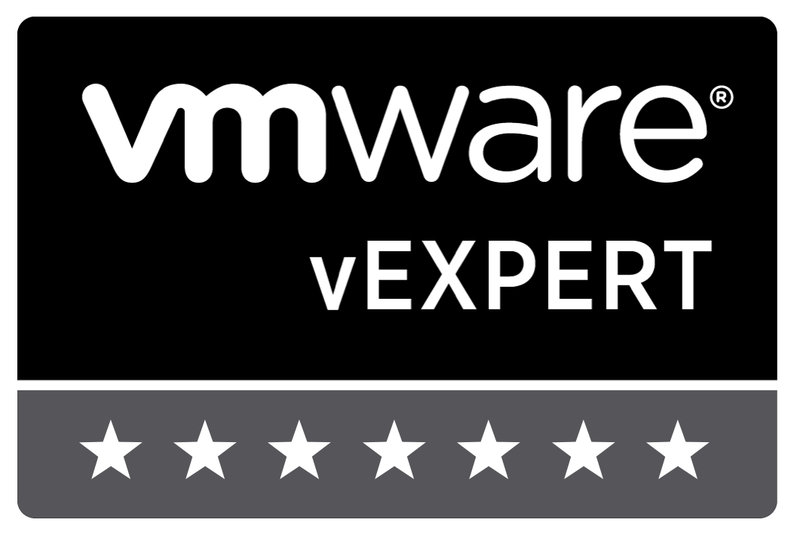 Author virtuallylgPosted on February 14, 2012 February 14, 2012 Categories VMwareTags applicationha, availability, cluster, heartbeat, vcenter, Vmware1 Comment on Are you running vCenter Server in a virtual machine, what are your high availability options? With various customer meetings and the London VMUG meeting I had last week this patch update slipped under the radar. I have been seeing issues with unrecoverable error when moving from guest to host which thankfully has been fixed in the update. VMware have released (24.1.12) the updated version of their desktop virtualization software VMware workstation 8.0.2 recently. This is a minor updated release with official support to Fedora 16 guest and Ubuntu 11.10 host. Also, VMware confirms that most of the customer issues have been fixed in latest 8.0.2 version. This is a free update from VMware for all Workstation 8 users.